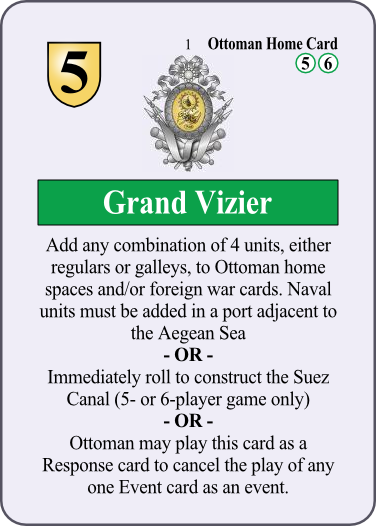 1 Grand Vizier Home 5 1 No Add any combination of 4 units, either regulars or naval squadrons, to Ottoman home spaces and/or foreign war cards. Naval units must be added in a port adjacent to the Aegean Sea. OR Immediately roll to construct the Suez Canal (5 or 6-player game only). 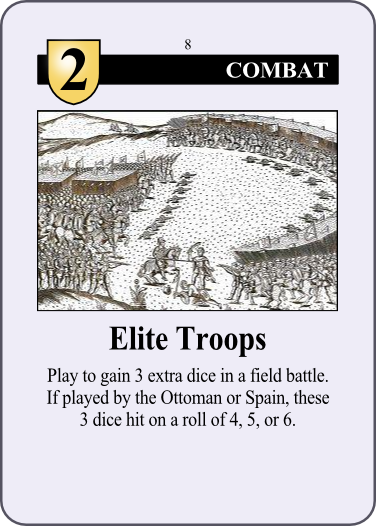 OR Ottoman may play this card as a Response card to cancel the play of any one Event card as an event. 2 Ottoman Tribute Home 5 1 No Declare war on Holy Roman Empire, Venice or Spain during the Action Phase, taking 2 CP of actions. Spain (or if Spain declines the Holy Roman Empire if a player power) may offer tribute to cancel this declaration of war. 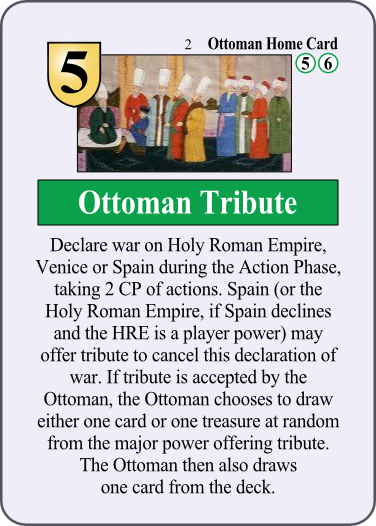 If tribute is accepted by the Ottoman, the Ottoman chooses to draw either one card or one treasure at random from the major power offering tribute. The Ottoman then also draws one card from the deck. 3 Spanish Road Home 5 1 No Add 1 regular in Milan. Move a leader from any space to Milan if desired. The Spanish player then moves a formation from Milan using the rules for spring deployment. 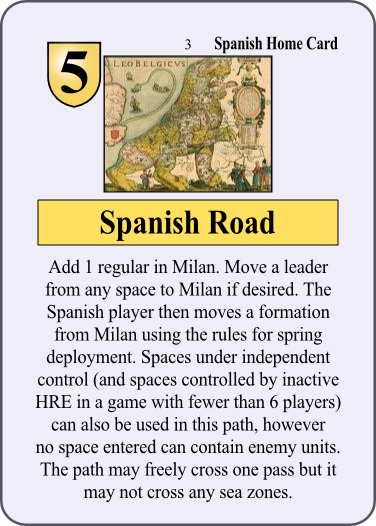 Spaces under independent control (and spaces controlled by inactive HRE in a game with fewer than 6 players) can also be used in this path, however no space entered can contain enemy units. The path may freely cross one pass but it may not cross any sea zones. 4 German Intervention Mandatory 2 1 No Resolve diplomatic status of Holy Roman Empire. Card remains in deck each turn. 5 Papal Bull Mandatory 2 1 No Immediately resolve the diplomatic status of the Papacy. 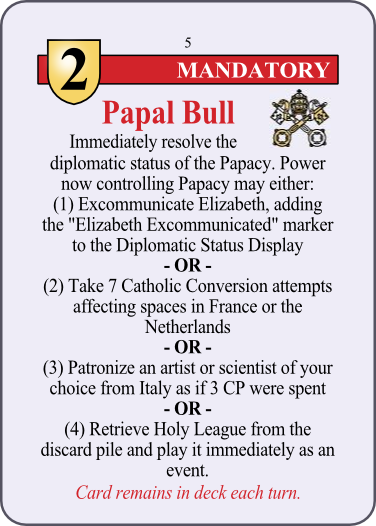 Power now controlling Papacy may either: (1) Excommunicate Elizabeth, adding the "Elizabeth Excommunicated" marker to the Diplomatic Status Display OR (2) Take 7 Catholic Conversion attempts affecting spaces in France or the Netherlands OR (3) Patronize an artist or scientist of your choice from Italy as if 3 CP were spent OR (4) Retrieve Holy League from the discard pile and play it immediately as an event. Card remains in deck each turn. 6 Selim II Mandatory 2 1 No Suleiman dies. 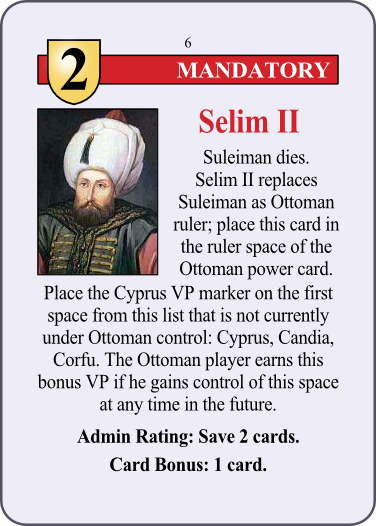 Selim II replaces Suleiman as Ottoman ruler; place this card in the ruler space of the Ottoman power card. Place the Cyprus VP marker on the first space from this list that is not currently under Ottoman control: Cyprus, Candia, Corfu. The Ottoman player earns this bonus VP if he gains control of this space at any time in the future. Admin Rating: Save 2 cards. Card Bonus: 1 card. 7 Desperate Assault Combat 1 1 No Play before an assault if you are the attacker. All your dice hit on 4, 5, 6. However the defender rolls twice as many dice as normal (still hitting on a 5 or 6). 8 Elite Troops Combat 2 1 No Play to gain 3 extra dice in a field battle. If played by the Ottoman or Spain, these 3 dice hit on a roll of 4, 5, or 6. 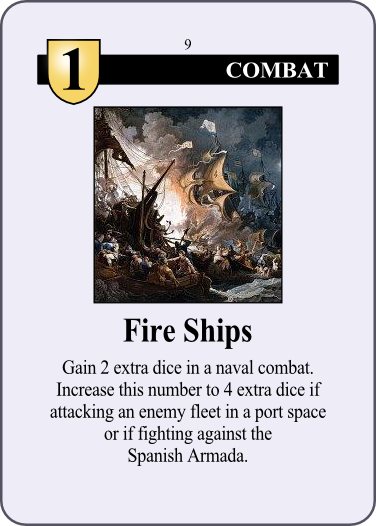 9 Fire Ships Combat 1 1 No Gain 2 extra dice in a naval combat. Increase this number to 4 extra dice if attacking an enemy fleet in a port space or if fighting against the Spanish Armada. 11 Dragut Falls Response 2 1 Yes* Play just after a stack containing Dragut has been involved in a combat or piracy attempt. After finishing the combat or piracy procedure, roll a die. 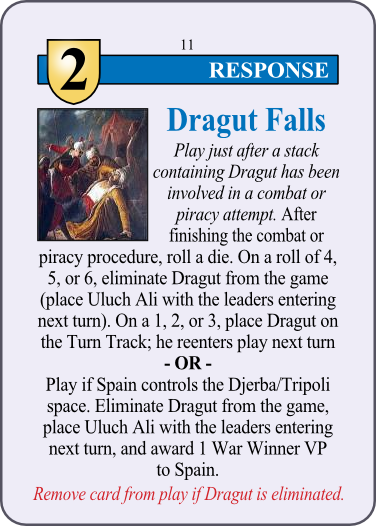 On a roll of 4, 5, or 6, eliminate Dragut from the game. On a 1, 2, or 3, place him on the Turn Track; he reenters play next turn. OR Play if Spain controls the Djerba/Tripoli space. Automatically eliminate Dragut from the game and award 1 War Winner VP to Spain. If Dragut is eliminated, add Uluch Ali to the Turn Track. Remove card from play if Dragut is eliminated. 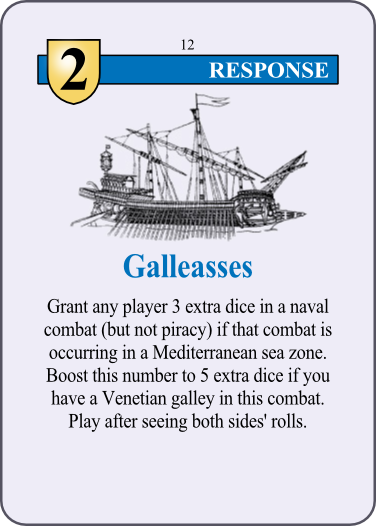 12 Galleasses Response 2 1 No Grant any player 3 extra dice in a naval combat (but not piracy) if that combat is occurring in a Mediterranean sea zone. Boost this number to 5 extra dice if you have a Venetian squadron in this combat. Play after seeing both sides' rolls. 13 Reiters Response 1 1 No If played by Ottomans, they eliminate 2 mercenaries anywhere on map. If played by any other power, place 2 of your power's mercenaries in any single space. Space chosen must be under friendly control but it does not have to be a home space for your power. You may increase it to 4 mercenaries if the space chosen is no more than 2 land connections from a home space of the Holy Roman Empire. 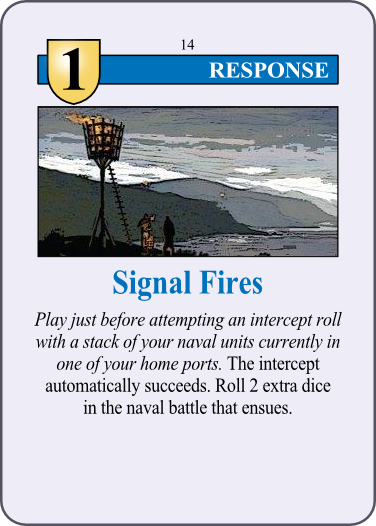 14 Signal Fires Response 1 1 No Play just before attempting an intercept roll with a stack of your naval units currently in one of your home ports. The intercept automatically succeeds. Roll 2 extra dice in the naval battle that ensues. 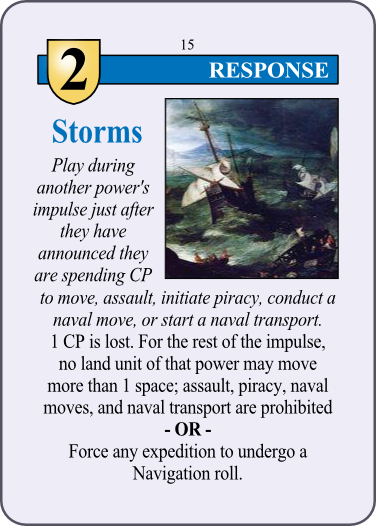 15 Storms Response 2 1 No Play during another power's impulse just after they have announced they are spending CP to move, assault, initiate piracy, conduct a naval move, or start a naval transport. 1 CP is lost. For the rest of the impulse, no land unit of that power may move more than 1 space; assault, piracy, naval moves, and naval transport are prohibited.OR Force any expedition to undergo a Navigation roll. 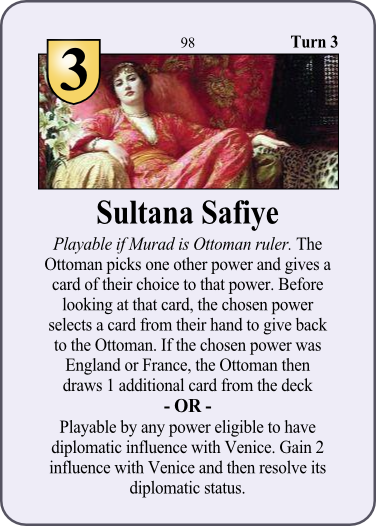 16 Sultan's Harem Response 5 1 No Playable as an event by the Ottoman player. 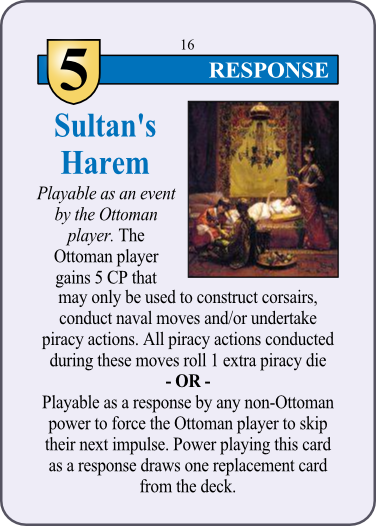 The Ottoman player gains 5 CP that may only be used to construct corsairs, conduct naval moves and/or undertake piracy actions. All piracy actions conducted during these moves roll 1 extra piracy die. OR Playable as a response by any non-Ottoman power to force the Ottoman player to skip their next impulse. Power playing this card as a response draws one replacement card from the deck. 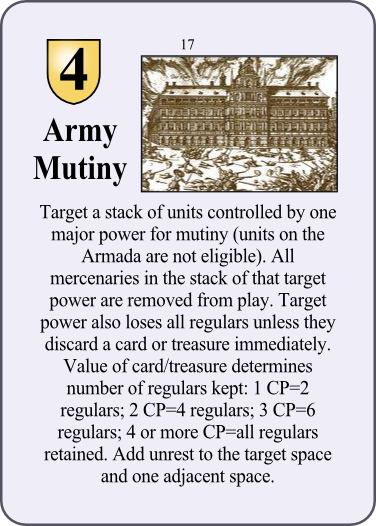 17 Army Mutiny Event 4 1 No Target a stack of units controlled by one major power for mutiny (units on the Armada are not eligible). All mercenaries in the stack of that target power are removed from play. Target power also loses all regulars unless they discard a card or treasure immediately. Value of card/treasure determines number of regulars kept: 1 CP=2 regulars 2 CP=4 regulars 3 CP=6 regulars 4 or more CP=all regulars retained. Add unrest to the target space and one adjacent space. 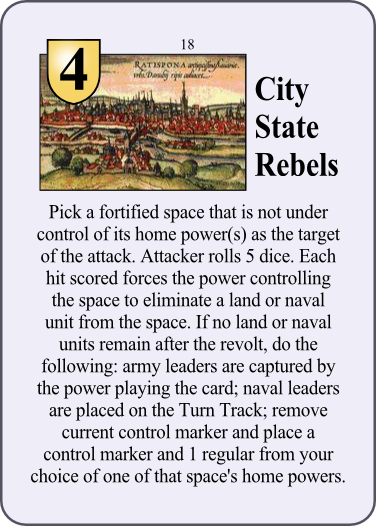 18 City State Rebels Event 4 1 No Pick a fortified space that is not under control of its home power(s) as the target of the attack. Attacker rolls 5 dice. Each hit scored forces the power controlling the space to eliminate a land or naval unit from the space. 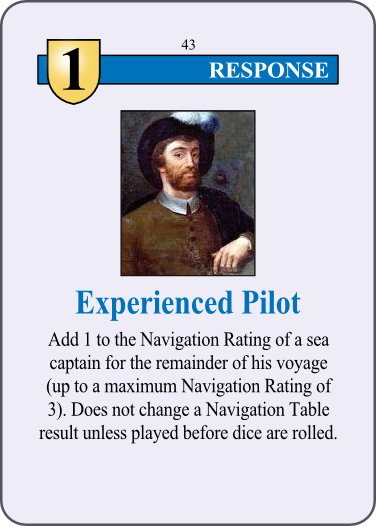 If no land or naval units remain after the revolt, do the following: army leaders are captured by the power playing the card; naval leaders are placed on the Turn Track; remove current control marker and place a control marker and 1 regular from your choice of one of that space's home powers. 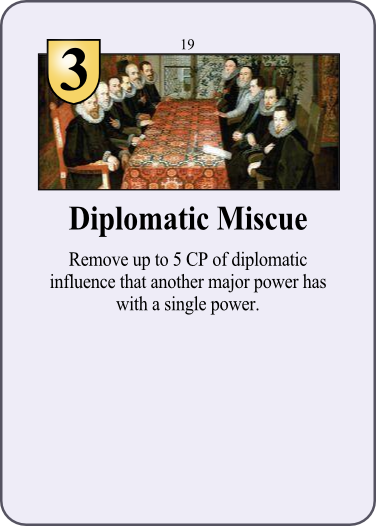 19 Diplomatic Miscue Event 3 1 No Remove up to 5 CP of diplomatic influence that another major power has with a single power. 20 Eloquent Ambassador Event 5 1 No Gain 3 CP of diplomatic influence with any power(s) you desire. Then select one power and resolve its diplomatic status (it may be a power on which influence was just placed). 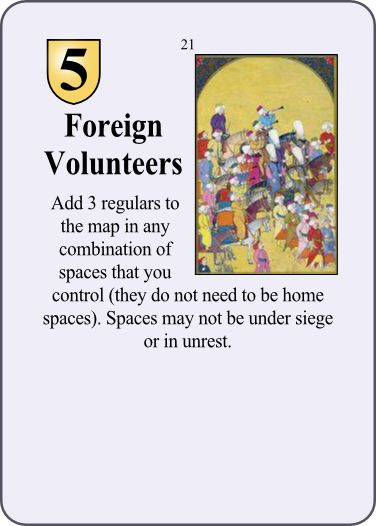 21 Foreign Volunteers Event 5 1 No Add 3 regulars to the map in any combination of spaces that you control (they do not need to be home spaces). Spaces may not be under siege or in unrest. 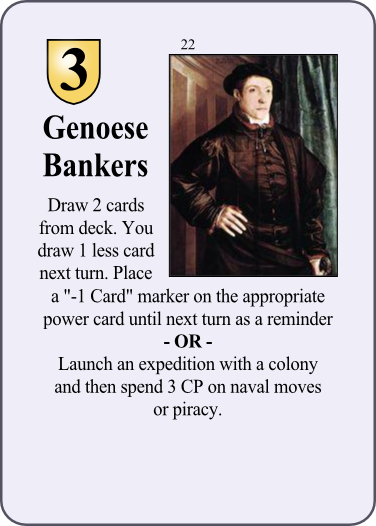 22 Genoese Bankers Event 3 1 No Draw 2 cards from deck. You draw 1 less card next turn. Place a "-1 Card" marker on the appropriate power card until next turn as a reminder. OR Launch an expedition with a colony and then spend 3 CP on naval moves or piracy. 23 German Recruitment Curtailed Event 3 1 No All mercenaries in a single space are removed from play. If multiple major powers have mercenaries in a single space, only one of the major powers can be affected by this event. 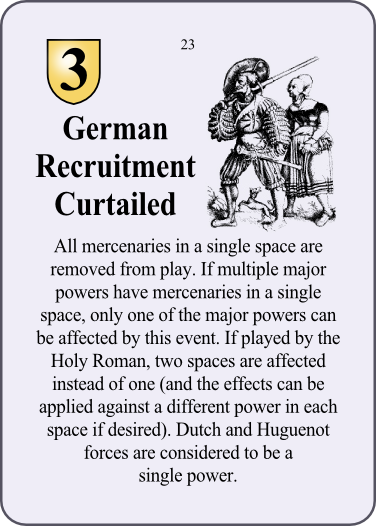 If played by the Holy Roman, two spaces are affected instead of one (and the effects can be applied against a different power in each space if desired). Dutch and Huguenot forces are considered to be a single power. 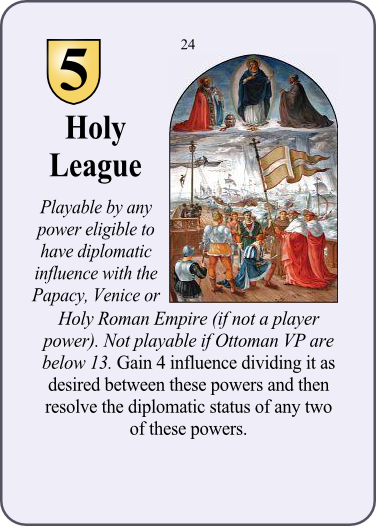 24 Holy League Event 5 1 No Playable by any power eligible to have diplomatic influence with the Papacy, Venice or Holy Roman Empire (if not a player power). Gain 4 influence dividing it as desired between these powers and then resolve the diplomatic status of any two of these powers. 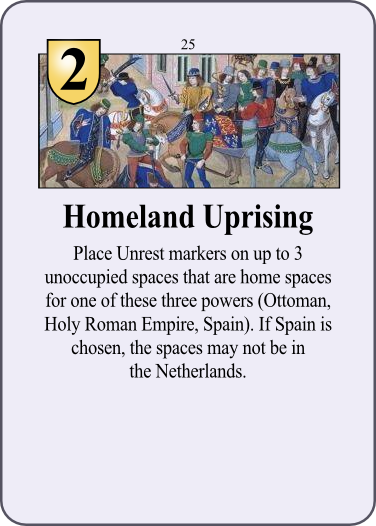 25 Homeland Uprising Event 2 1 No Place Unrest markers on up to 3 unoccupied spaces that are home spaces for one of these three powers (Ottoman, Holy Roman Empire, Spain). If Spain is chosen, the spaces may not be in the Netherlands. 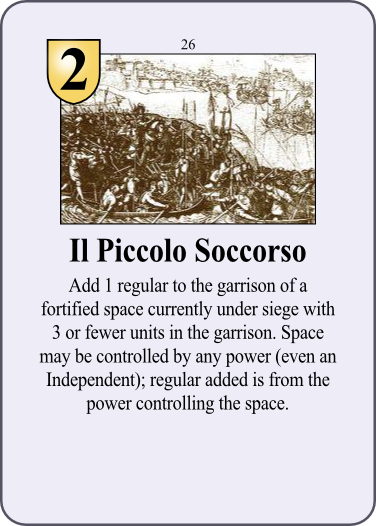 26 Il Piccolo Soccorso Event 2 1 No Add 1 regular to the garrison of a fortified space currently under siege with 3 or fewer units in the garrison. Space may be controlled by any power (even an Independent); regular added is from the power controlling the space. 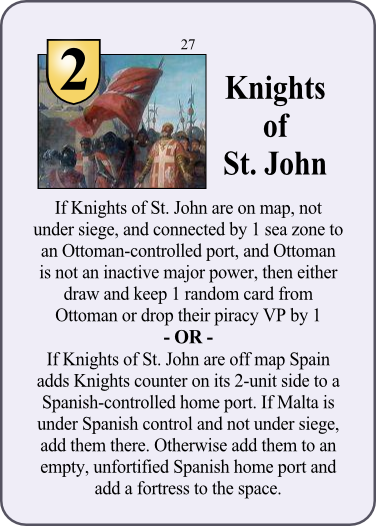 27 Knights of St. John Event 2 1 No If Knights of St. John are on map, not under siege, and connected by 1 sea zone to an Ottoman-controlled port, and Ottoman is not an inactive major power, then either draw and keep 1 random card from Ottoman or drop their piracy VP by 1. OR If Knights of St. John are off map Spain adds Knights counter on its 2-unit side to a Spanish-controlled home port. If Malta is under Spanish control and not under siege, add them there. Otherwise add them to an empty, unfortified Spanish home port and add a fortress to the space. 28 Morisco Revolt Event 2 1 Yes Playable if Ottoman is At War with Spain. Eliminate all land units in the Granada space, place Granada into unrest, and add the 2 strength Ottoman counter marked as "Morisco" to that space. See 23.1 for usage of this unit. Place unrest markers on 2 unoccupied spaces within 2 spaces of Granada. If the Morisco counter is in a Spanish home space at start of any Winter Phase, the Ottoman places unrest markers on 2 unoccupied spaces within 2 of the Morisco unit. 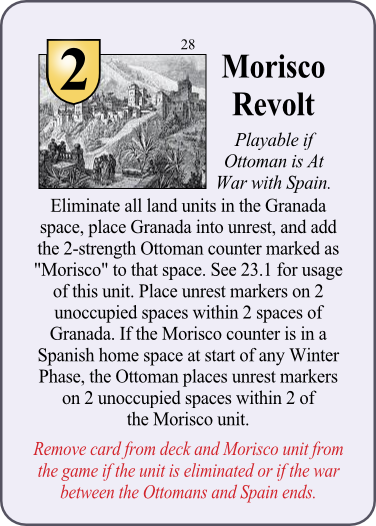 Remove card from deck and Morisco unit from the game if the unit is eliminated or if the war between the Ottoman and Spain ends. 29 Muscovy Company Event 2 1 No Place a "+1 Card" marker on your power card. 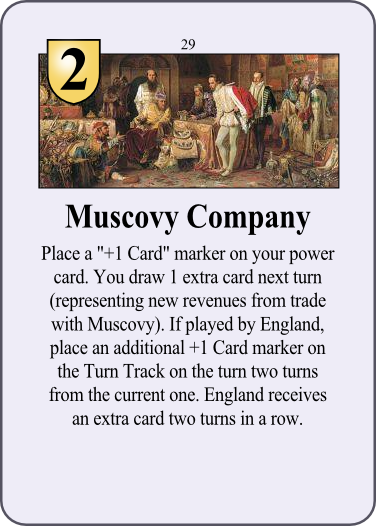 You draw 1 extra card next turn (representing new revenues from trade with Muscovy). If played by England, place an additional +1 Card marker on the Turn Track on the turn two turns from the current one. England receives an extra card two turns in a row. 30 Ruler Falls Ill Event 3 1 No Play against any other major power. 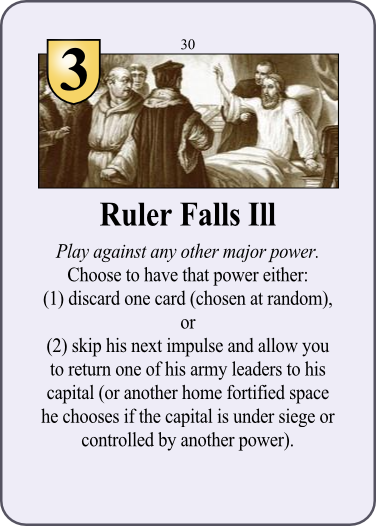 Choose to have that power either: -- discard one card (chosen at random), or -- skip his next impulse and allow you to return one of his army leaders to his capital (or another home fortified space he chooses if the capital is under siege or controlled by another power). 31 Treachery! Event 5 1 No Play against any fortified space that is currently under siege, even a space where a besieging power does not meet the requirements for assault. Immediately initiate an assault by a besieging power on the units within the fortifications. 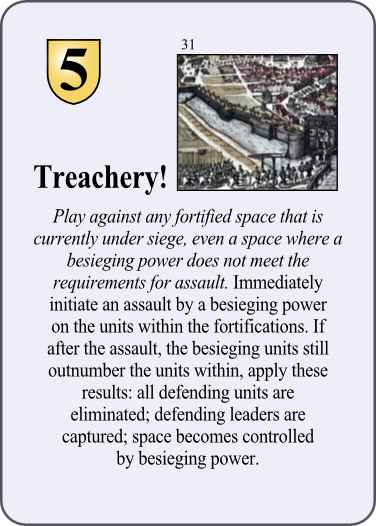 If after the assault, the besieging units still outnumber the units within, apply these results: all defending units are eliminated; defending leaders are captured; space becomes controlled by besieging power. 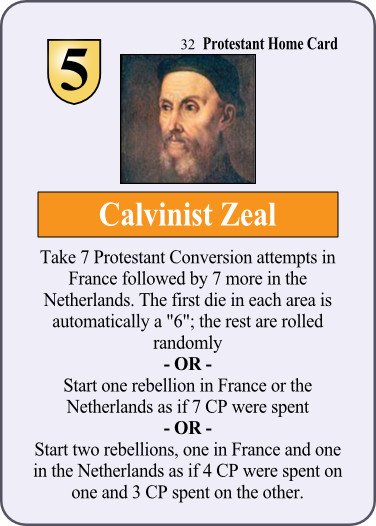 32 Calvinist Zeal Home 5 1 No Take 7 Protestant Conversion attempts in France followed by 7 more in the Netherlands. The first die in each area is automatically a "6"; the rest are rolled randomly. OR Start one rebellion in France or the Netherlands as if 7 CP were spent. OR Start two rebellions, one in France and one in the Netherlands as if 4 CP were spent on one and 3 CP spent on the other. 33 Gouvernante de France Home 5 1 No If a French royal is betrothed, add the "+2 Wedding Festivities" marker to that wedding. Then either draw a new card from the deck or take the Grand Tour card from the discard pile. 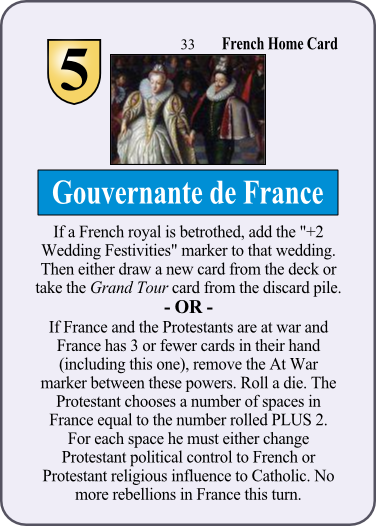 OR If France and the Protestants are at war and France has 3 or fewer cards in their hand (including this one), remove the At War marker between these powers. Roll a die. The Protestant chooses a number of spaces in France equal to the number rolled PLUS 2. For each space he must either change Protestant political control to French or Protestant religious influence to Catholic. No more rebellions in France this turn. 34 Holy Roman Intercession Home 5 1 No Playable by the Holy Roman Empire to join a war in progress between two other major powers. Add an At War marker with one of these powers (may not be a current HRE ally) and an Ally marker with the other (if not already a HRE ally). Add any 2 HRE land units to a HRE home space; you may move a HRE army leader to this space too. 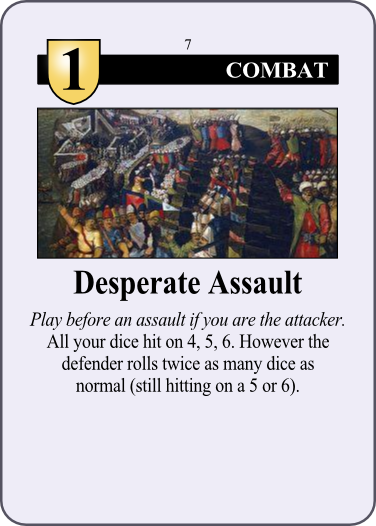 Power now at war with HRE rolls 5 dice and for each "1" rolled adds an Unrest marker to any Holy Roman home space. 35 Patron of Arts & Sciences Home 5 1 No Sponsor a specific artist or scientist of your choice from Italy or a random artist or random scientist from the Holy Roman Empire as if you spent 3 CP on the Patronize action. 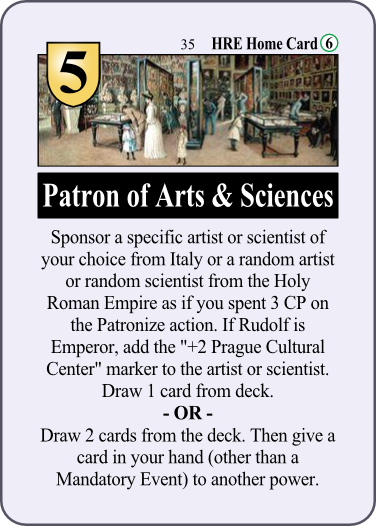 If Rudolf is Emperor, add the "+2 Prague Cultural Center" marker to the artist or scientist. Draw 1 card from deck. OR Draw 2 cards from the deck. Then give a card in your hand (other than a Mandatory Event) to another power. 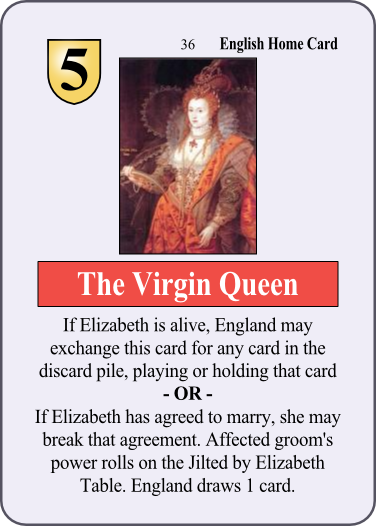 36 The Virgin Queen Home 5 1 No If Elizabeth is alive, England may exchange this card for any card in the discard pile, playing or holding that card OR If Elizabeth has agreed to marry, she may break that agreement. Affected groom's power rolls on the Jilted By Elizabeth Table. England draws 1 card. 37 The Sublime Porte Mandatory 2 1 No Resolve diplomatic status of Ottoman. Card remains in deck each turn. 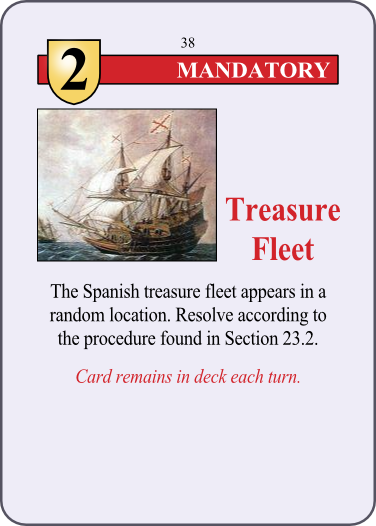 38 Treasure Fleet Mandatory 2 1 No The Spanish treasure fleet appears in a random location. Resolve according to the procedure found in Section 23.2. Card remains in deck each turn. 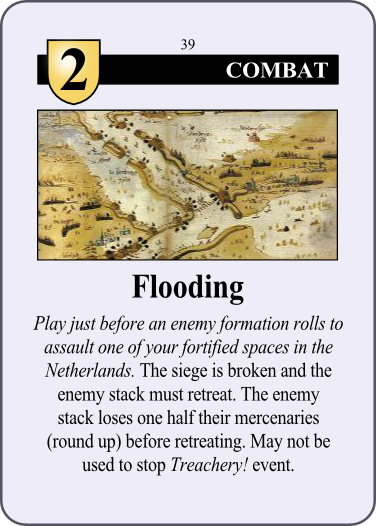 39 Flooding Combat 2 1 No Play just before an enemy formation rolls to assault one of your fortified spaces in Netherlands. The siege is broken and the enemy stack must retreat. The enemy stack loses one half their mercenaries (round up) before retreating. May not be used to stop Treachery! event. 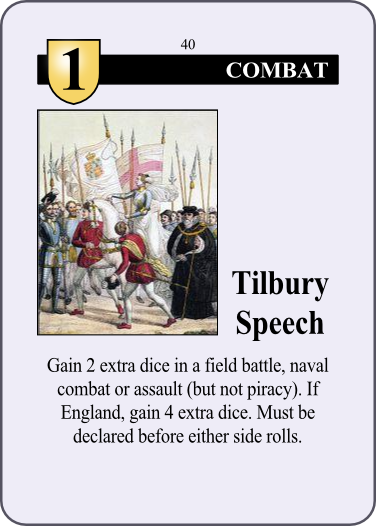 40 Tilbury Speech Combat 1 1 No Gain 2 extra dice in a field battle, naval combat or assault (but not piracy). If England, gain 4 extra dice. Must be declared before either side rolls. 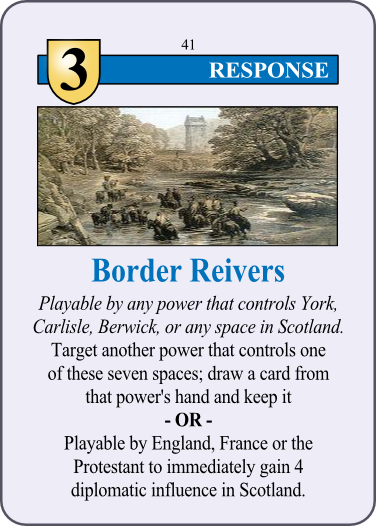 41 Border Reivers Response 3 1 No Playable by any power that controls York, Carlisle, Berwick, or any space in Scotland. Target another power that controls one of these seven spaces; draw a card from that power's hand and keep it. OR Playable by England, France or the Protestant to immediately gain 4 diplomatic influence in Scotland. 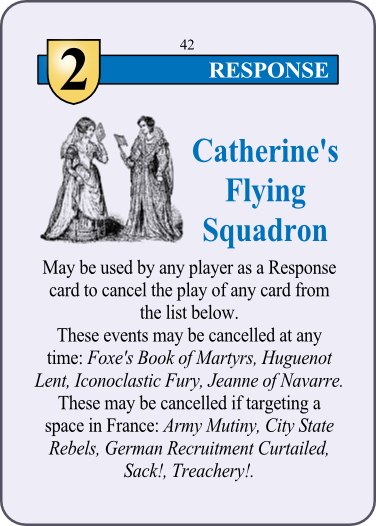 42 Catherine's Flying Squadron Response 2 1 No May be used by any player as a Response card to cancel the play of any card from the list below. These events may be cancelled at any time: Foxe's Book of Martyrs, Huguenot Lent, Iconoclastic Fury, Jeanne of Navarre. These may be cancelled if targeting a space in France: Army Mutiny, City State Rebels, German Recruitment Curtailed, Sack, Treachery. 43 Experienced Pilot Response 1 1 No Add 1 to the Navigation Rating of a sea captain for the remainder of his voyage (up to a maximum Navigation Rating of 3). Does not change a Navigation Table result unless played before dice are rolled. 44 Sack! Response 5 1 No Play after an assault captures a fortified space. Adjacent enemy-controlled fortified spaces might also surrender. Roll 1 die for each. 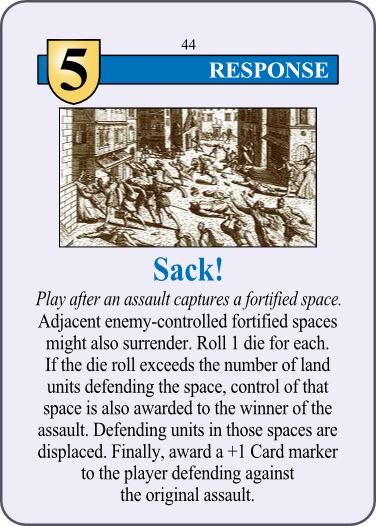 If the die roll exceeds the number of land units defending the space, control of that space is also awarded to the winner of the assault. Defending units in those spaces are displaced. 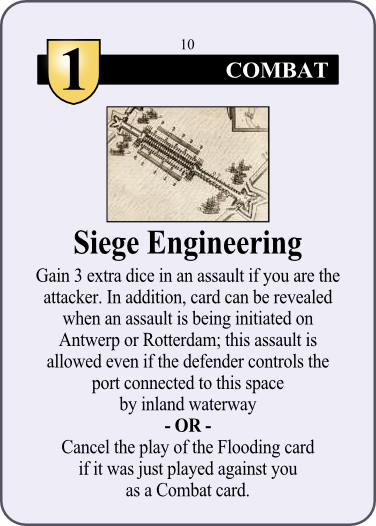 Finally, award a +1 Card marker to the player defending against the original assault. 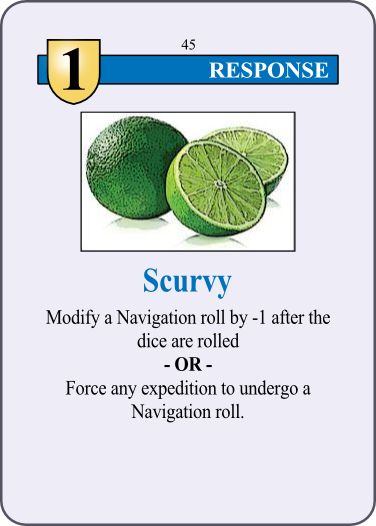 45 Scurvy Response 1 1 No Modify a Navigation roll by -1 after the dice are rolled OR Force any expedition to undergo a Navigation roll. 46 Spanish Fury Response 4 1 No Play after an assault captures a key. Winning power draws and keeps a card from the loser's hand (if any) and another card from the deck. Finally, award a +1 Card marker to the defending player. 47 Belgic Confession Event 4 1 No Take 8 Protestant Conversion attempts that can affect spaces in the Netherlands. The first die is automatically a "6"; the rest are rolled randomly. Treat all rolls of "3" as if they were "4". 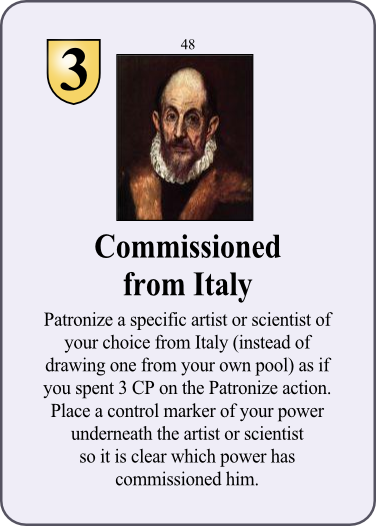 48 Commissioned from Italy Event 3 1 No Patronize a specific artist or scientist of your choice from Italy (instead of drawing one from your own pool) as if you spent 3 CP on the Patronize action. Place a control marker of your power underneath the artist or scientist so it is clear which power has commissioned him. 49 Conquest of the Phillippines Event 4 1 Yes Add a Spanish control marker to the Phillippines space. Add 1 treasure to the 5th treasure box immediately. 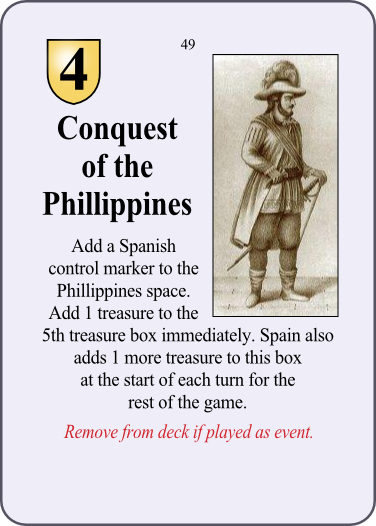 Spain also adds 1 more treasure to this box at the start of each turn for the rest of the game. Remove from deck if played as event. 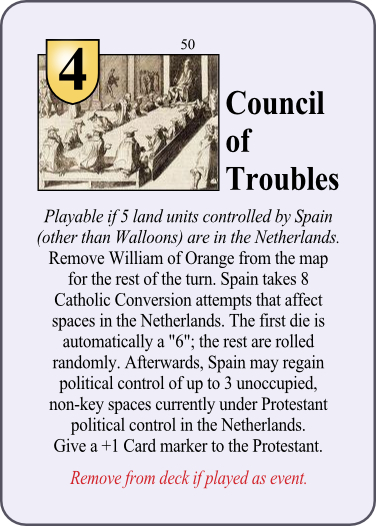 50 Council of Troubles Event 4 1 Yes Playable if 5 land units controlled by Spain (other than Walloons) are in the Netherlands. Remove William of Orange from the map for the rest of the turn. Spain takes 8 Catholic Conversion attempts that affect spaces in the Netherlands. The first die is automatically a "6"; the rest are rolled randomly. 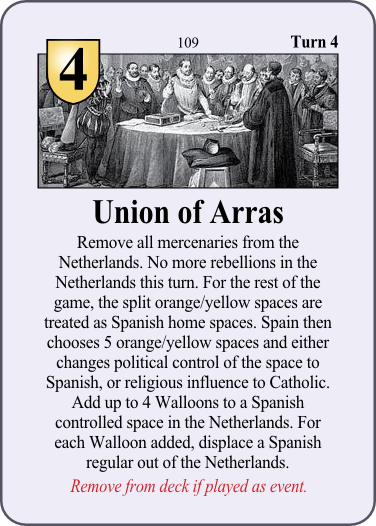 Afterwards, Spain may regain political control of up to 3 unoccupied, non-key spaces currently under Protestant political control in the Netherlands. 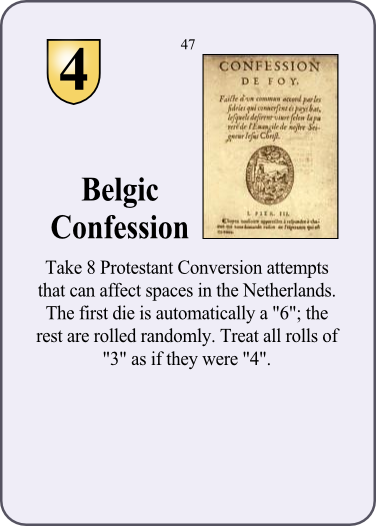 Give a +1 Card marker to the Protestant. Remove from deck if played as event. 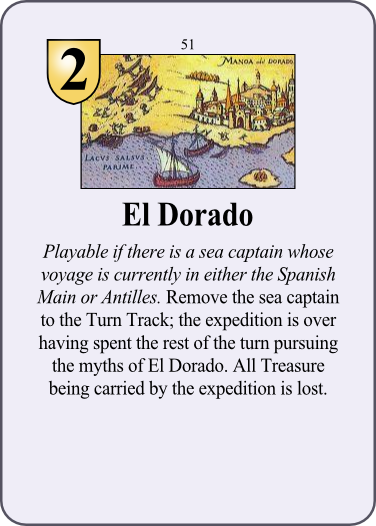 51 El Dorado Event 2 1 No Playable if there is a sea captain whose voyage is currently in either the Spanish Main or Antilles. Remove the sea captain to the Turn Track; the expedition is over having spent the rest of the turn pursuing the myths of El Dorado. All Treasure being carried by the expediation is lost. 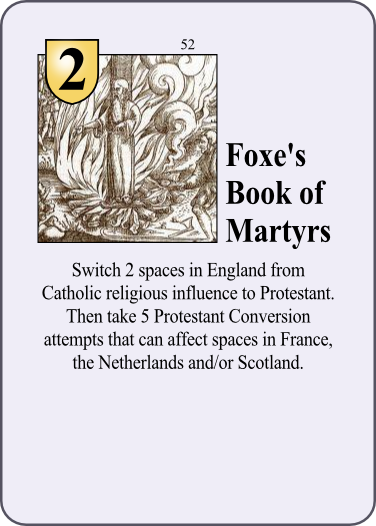 52 Foxe's Book of Martyrs Event 2 1 No Switch 2 spaces in England from Catholic religious influence to Protestant. Then take 5 Protestant Conversion attempts that can affect spaces in France, Netherlands and/or Scotland. 53 Grand Tour Event 4 1 Yes* Eliminate unrest from all French home spaces. 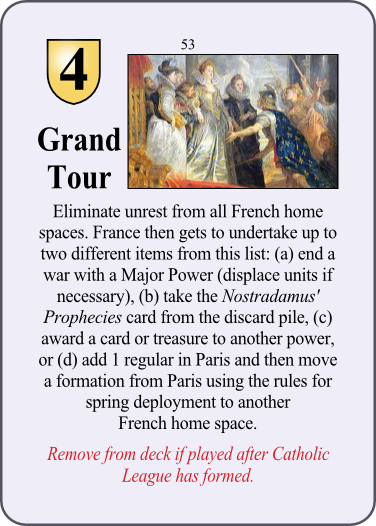 France then gets to undertake up to two different items from this list: (a) end a war with a Major Power (displace units if necessary), (b) take the Nostradamus' Prophecies card from the discard pile, (c) award a card or treasure to another power, or (d) add 1 regular in Paris and then move a formation from Paris using the rules for spring deployment to another French home space. Remove from deck if played after Catholic League has formed. 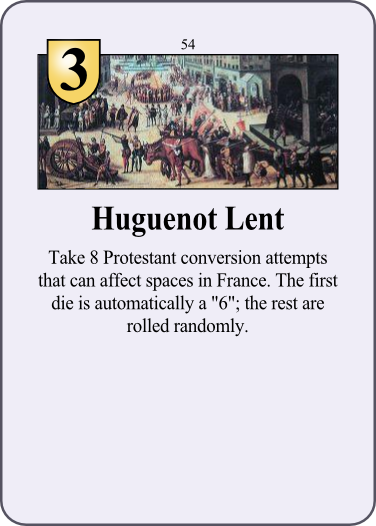 54 Huguenot Lent Event 3 1 No Take 8 Protestant conversion attempts that can affect spaces in France. The first die is automatically a "6"; the rest are rolled randomly. 55 Iconoclastic Fury Event 3 1 No Take 7 Protestant Conversion attempts that can affect spaces in any one area, either France or the Netherlands. Treat all rolls of "5" as if they were a "6". Add 1 space of Unrest for each "1" rolled (not just for any "1" being rolled). 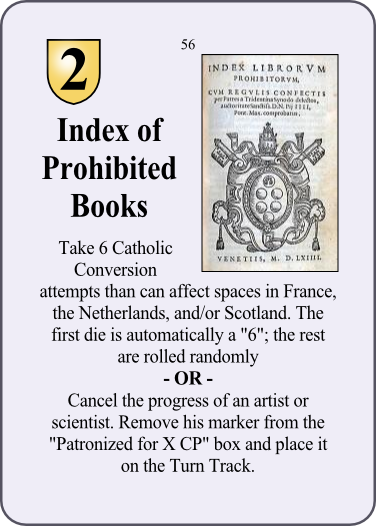 56 Index of Prohibited Books Event 2 1 No Take 6 Catholic Conversion attempts that can affect spaces in France, Netherlands, and/or Scotland. The first die is automatically a "6"; the rest are rolled randomly. OR Cancel the progress of an artist or scientist. Remove their marker from the "Patronized for X CP" box and place it on the Turn Track. 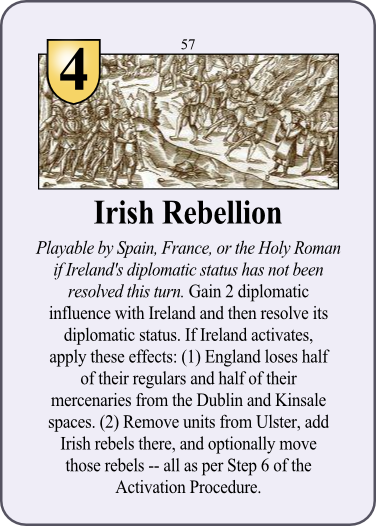 57 Irish Rebellion Event 4 1 No Playable by Spain, France or the Holy Roman if Ireland's diplomatic status has not been resolved this turn. Gain 2 diplomatic influence with Ireland and then resolve its diplomatic status. If Ireland activates, apply these effects: (1) England loses half of their regulars and half of their mercenaries from the Dublin and Kinsale spaces. (2) Remove units from Ulster, add Irish rebels there, and optionally move those rebels -- all as per Step 6 of the Activation Procedure. 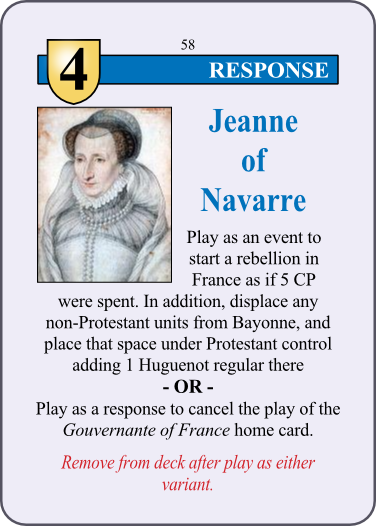 58 Jeanne of Navarre Response 4 1 Yes Play as an event to start a rebellion in France as if 5 CP were spent. In addition, displace any non-Protestant units from Bayonne, and place that space under Protestant control adding 1 Huguenot regular there. OR Play as a response to cancel play of the Gouvernante of France home card. Remove from deck after play as either variant. 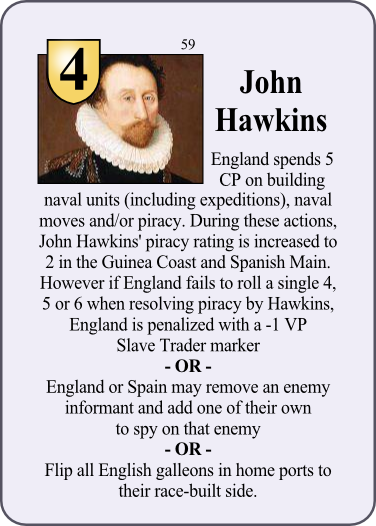 59 John Hawkins Event 4 1 No England spends 5 CP on building naval units (including expeditions), naval moves and/or piracy. During these actions, John Hawkins' piracy rating is increased to 2 in the Guinea Coast and Spanish Main. However if England fails to roll a single 4, 5 or 6 when resolving piracy by Hawkins, England is penalized with a -1 VP Slave Trader marker. OR England or Spain may remove an enemy informant and add one of their own to spy on that enemy. OR Flip all English galleons in home ports to their race-built side. 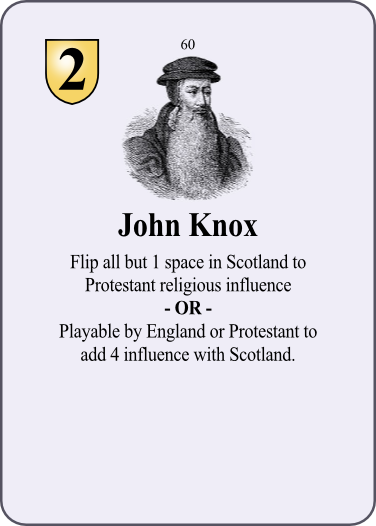 60 John Knox Event 2 1 No Flip all but 1 space in Scotland to Protestant religious influence. OR Playable by England or Protestant to add 4 influence with Scotland. 61 Menendez de Aviles Event 2 1 No Roll a die. On a 3 or higher, remove an English, French or Protestant colony from Florida. This space is under Spanish control for the rest of the game. If Spain has an Informant spying on the target power, the roll is automatic OR Spain builds a Galleon placing it directly into the Treasure Fleet Escorts box OR Spain adds a fortress to any Spanish World Map space and a Patrol to any ocean zone. 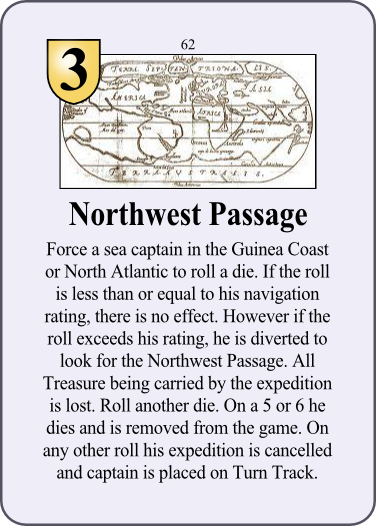 62 Northwest Passage Event 3 1 No Force a sea captain in the Guinea Coast or North Atlantic to roll a die. If the roll is less than or equal to his navigation rating, there is no effect. However if the roll exceeds his rating, he is diverted to look for the Northwest Passage. All Treasure being carried by the expedition is lost. Roll another die. On a 5 or 6 he dies and is removed from the game. On any other roll his expedition is cancelled and captain is placed on Turn Track. 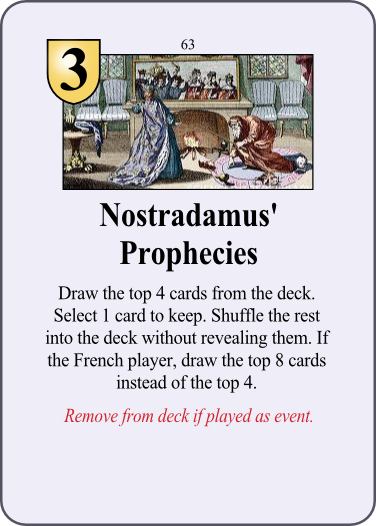 63 Nostradamus' Prophecies Event 3 1 Yes Draw the top 4 cards from the deck. Select 1 card to keep. Shuffle the rest into the deck without revealing them. If the French player, draw the top 8 cards instead of the top 4. Remove from deck if played as event. 64 Philosopher's Stone Event 2 1 No Cancel the progress of a scientist. 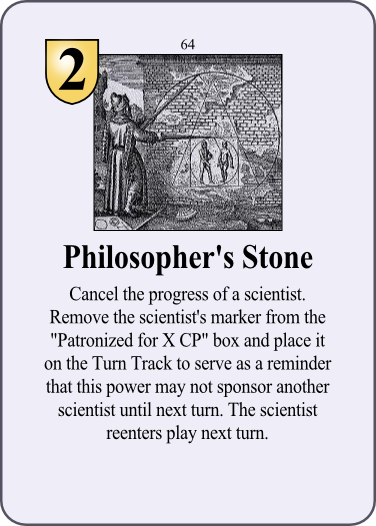 Remove the scientist's marker from the "Patronized for X CP" box and place it on the Turn Track to serve as a reminder that this power may not sponsor another scientist until next turn. The scientist reenters play next turn. 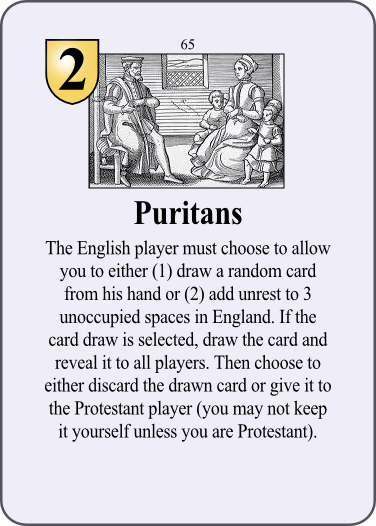 65 Puritans Event 2 1 No The English player must choose to allow you to either (1) draw a random card from his hand or (2) add unrest to 3 unoccupied spaces in England. If the card draw is selected, draw the card and reveal it to all players. 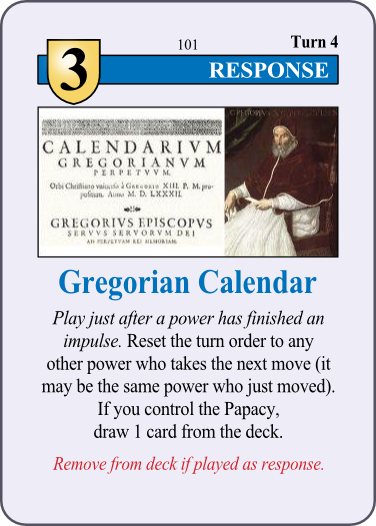 Then choose to either discard the drawn card or give it to the Protestant player (you may not keep it yourself unless you are Protestant). 66 Sea Beggars Event 5 1 No Dutch gain political control of any unoccupied port space in the Netherlands. Switch religious influence to Protestant if not already. Add one Dutch galleon and one Dutch regular to the space. If the space chosen is Brielle or Flushing, add a second Dutch galleon. If Spain controls a port connected to the North Sea, the Protestant receives a free Piracy roll. 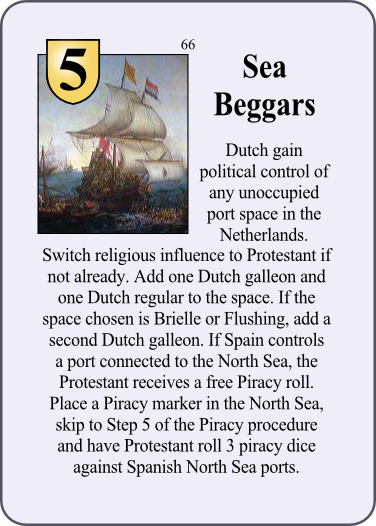 Place a Piracy marker in the North Sea, skip to Step 5 of the Piracy procedure and have Protestant roll 3 piracy dice against Spanish North Sea ports. 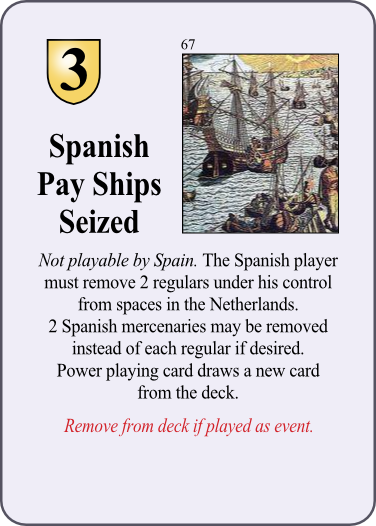 67 Spanish Pay Ships Seized Event 3 1 Yes Not playable by Spain. The Spanish player must remove 2 regulars under his control from spaces in the Netherlands. 2 Spanish mercenaries may be removed instead of each regular if desired. Power playing card draws a new card from the deck. Remove from deck if played as event. 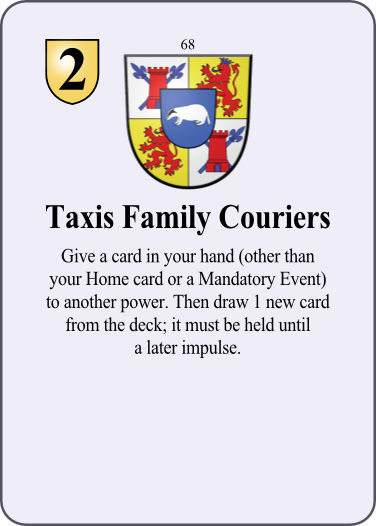 68 Taxis Family Couriers Event 2 1 No Give a card in your hand (other than your Home card or a Mandatory Event) to another power. Then draw 1 new card from the deck; it must be held until a later impulse. 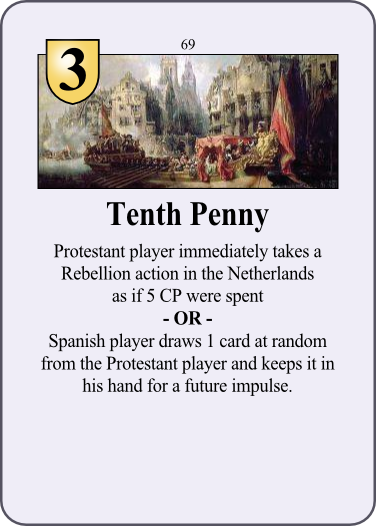 69 Tenth Penny Event 3 1 No Protestant player immediately takes a Rebellion action in the Netherlands as if 5 CP were spent. OR Spanish player draws 1 card at random from the Protestant player and keeps it in his hand for a future impulse. 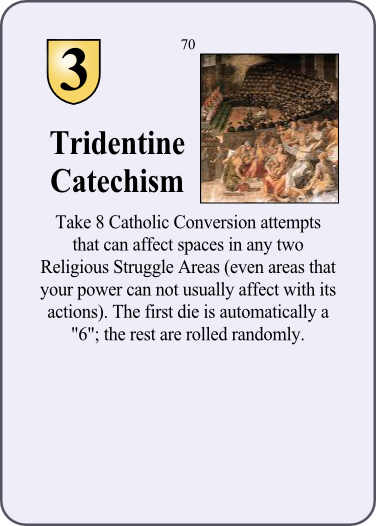 70 Tridentine Catechism Event 3 1 No Take 8 Catholic Conversion attempts that can affect spaces in any two Religious Struggle Areas (even areas that your power can not usually affect with its actions). The first die is automatically a "6"; the rest are rolled randomly. 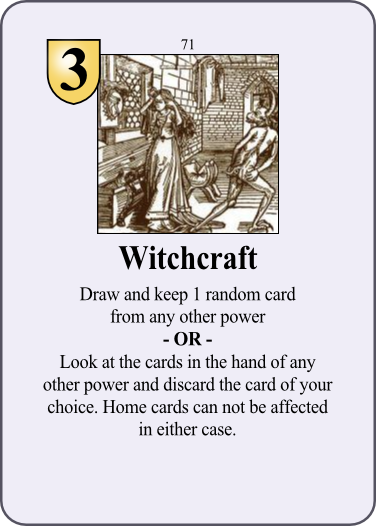 71 Witchcraft Event 3 1 No Draw and keep 1 random card from any other power OR Look at the cards in the hand of any other power and discard the card of your choice. Home cards can not be affected in either case. 72 War with Poland Event 4 1 No Playable if Holy Roman Empire is not at war with Ottoman. 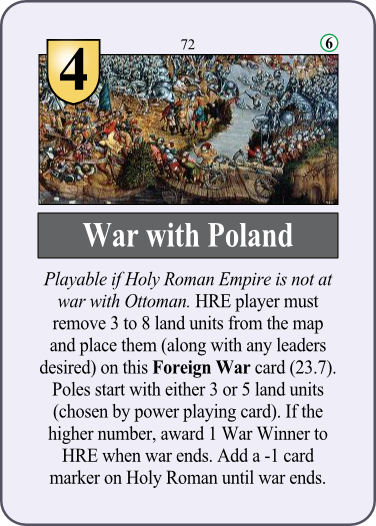 Holy Roman player must remove 3 to 8 land units from the map and place them (along with any leaders desired) on this Foreign War card (23.7). Poles start with either 3 or 5 land units (chosen by power playing card). If the higher number, award 1 War Winner to Holy Roman when war ends. 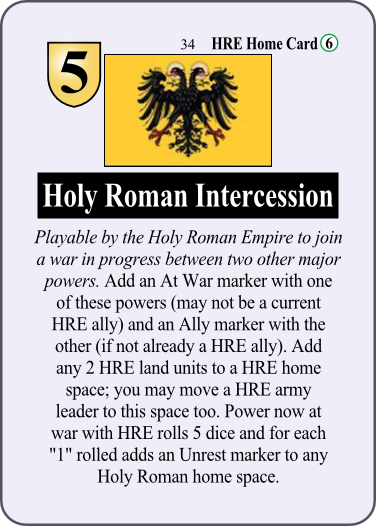 Add a -1 card marker on Holy Roman until war ends. 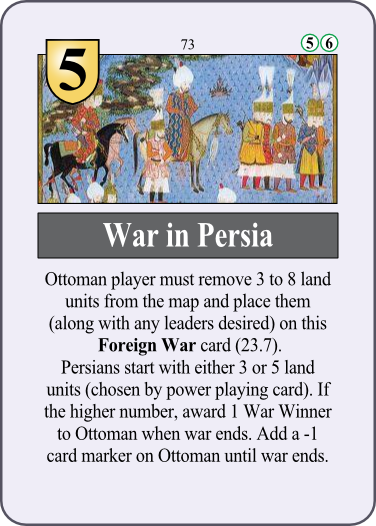 73 War in Persia Event 5 1 No Ottoman player must remove 3 to 8 land units from the map and place them (along with any leaders desired) on this Foreign War card (23.7). Persians start with either 3 or 5 land units (chosen by power playing card). If the higher number, award 1 War Winner to Ottoman when war ends. Add a -1 card marker on Ottoman until war ends. 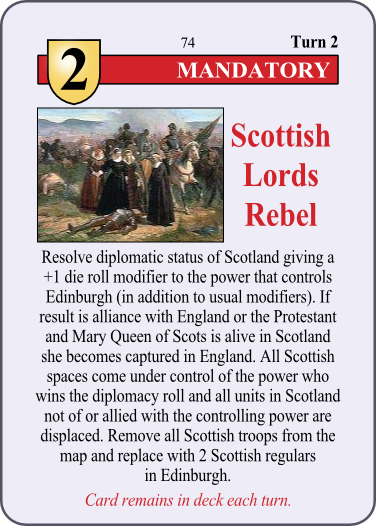 74 Scottish Lords Rebel Mandatory 2 2 No Resolve diplomatic status of Scotland giving a +1 die roll modifier to the power that controls Edinburgh (in addition to usual modifiers). If result is alliance with England or the Protestant and Mary Queen of Scots is alive in Scotland she becomes captured in England. All Scottish spaces come under control of the power who wins the diplomacy roll and all units in Scotland not of or allied with the controlling power are displaced. Remove all Scottish troops from the map and replace with 2 Scottish regulars in Edinburgh. Card remains in deck each turn. 75 Lost Colony Mandatory 2 2 No Target a colony in the Atlantic Coast. The owning player must roll a die to keep his colony, succeeding on a 5 or 6. If any other number is rolled, the colony is eliminated. 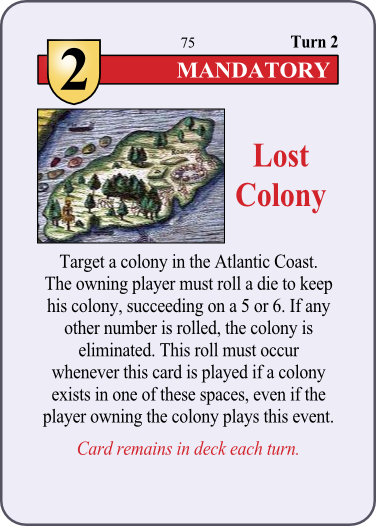 This roll must occur whenever this card is played if a colony exists in one of these spaces, even if the player owning the colony plays this event. Card remains in deck each turn. 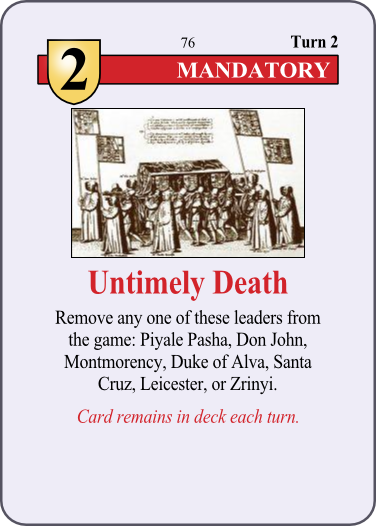 76 Untimely Death Mandatory 2 2 No Remove any one of these leaders from the game: Piyale Pasha, Don John, Montmorency, Duke of Alva, Santa Cruz, Leicester, or Zrinyi. Card remains in deck each turn. 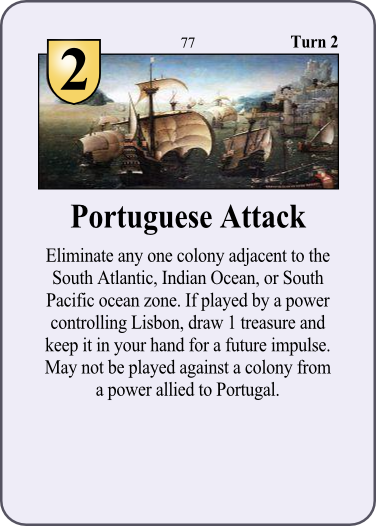 77 Portuguese Attack Event 2 2 No Eliminate any one colony adjacent to the South Atlantic, Indian Ocean, or South Pacific ocean zone. If played by a power controlling Lisbon, draw 1 treasure and keep it in your hand for a future impulse. May not be played against a colony from a power allied to Portugal. 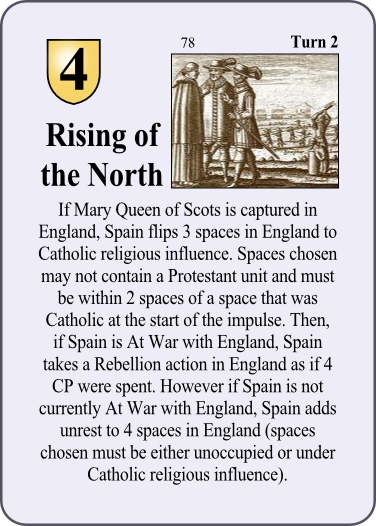 78 Rising of the North Event 4 2 No If Mary Queen of Scots is captured in England, Spain flips 3 spaces in England to Catholic religious influence. Spaces chosen may not contain a Protestant unit and must be within 2 spaces of a space that was Catholic at the start of the impulse. Then, if Spain is At War with England, Spain takes a Rebellion action in England as if 4 CP were spent. However if Spain is not currently At War with England, Spain adds unrest to 4 spaces in England (spaces chosen must be either unoccupied or under Catholic religious influence). 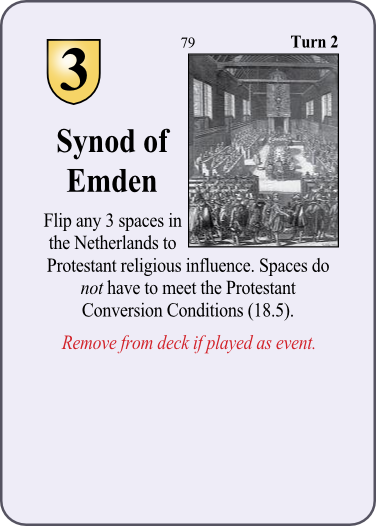 79 Synod of Emden Event 3 2 Yes Flip any 3 spaces in the Netherlands to Protestant religious influence. Spaces do NOT have to meet the Protestant Conversion Conditions (18.5). Remove from deck if played as event. 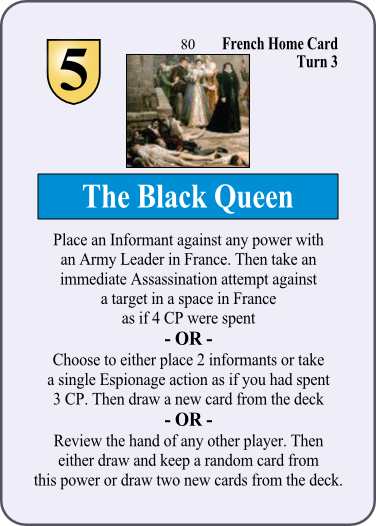 80 The Black Queen Home 5 3 No Place an Informant against any power with an Army Leader in France. Then take an immediate Assassination attempt against a target in a space in France as if 4 CP were spent. 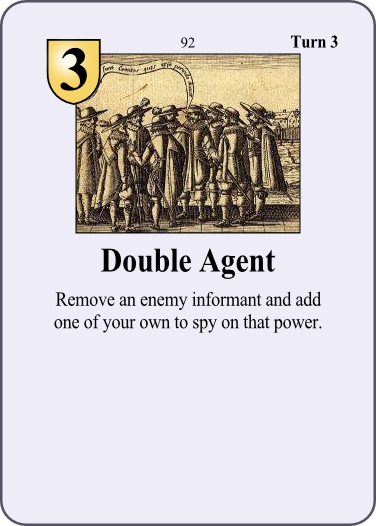 OR Choose to either place 2 informants or take a single Espionage action as if you had spent 3 CP. Then draw a new card from the deck. OR Review the hand of any other player. Then either draw and keep a random card from this power or draw two cards from the deck. 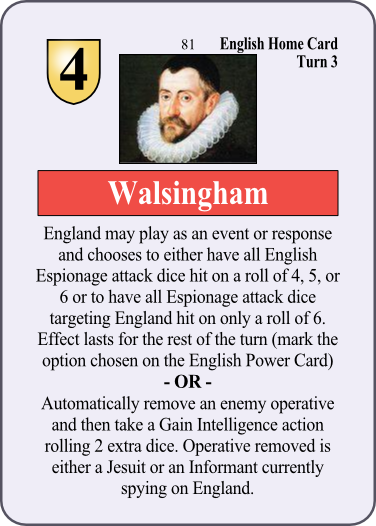 81 Walsingham Home 4 3 No England may play as an event or response and chooses to either have all English Espionage attack dice hit on a roll of 4, 5, or 6 or to have all Espionage attack dice targeting England hit on only a roll of 6. Effect lasts for the rest of the turn (mark the option chosen on the English Power Card) OR Automatically remove an enemy operative and then take a Gain Intelligence action rolling 2 extra dice. Operative removed is either a Jesuit or an Informant currently spying on England. 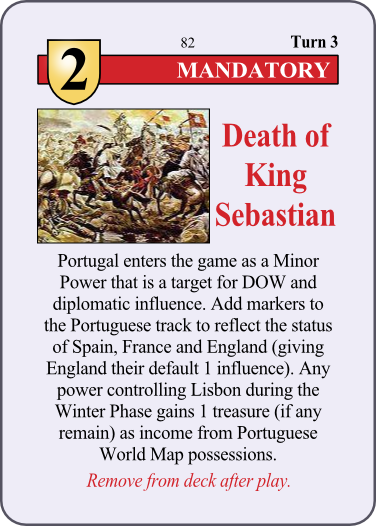 82 Death of King Sebastian Mandatory 2 3 Yes Portugal enters the game as a Minor Power that is a target for DOW and diplomatic influence. Add markers to the Portuguese track to reflect the status of Spain, France and England (giving England their default 1 influence). Any power controlling Lisbon during the Winter Phase gains 1 treasure (if any remain) as income from Portuguese World Map possessions. Remove from deck after play. 83 Dutch Revolt Mandatory 2 3 No Count the number of spaces under Spanish political control (and not in Unrest) in the Netherlands. 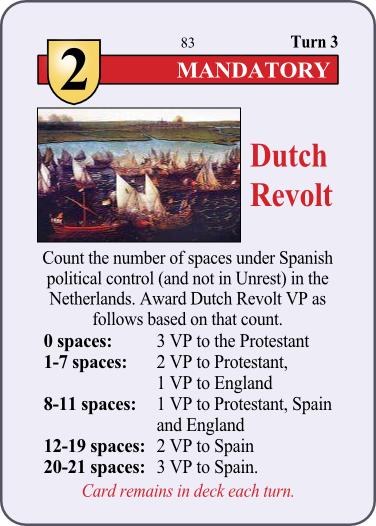 Award Dutch Revolt VP as follows based on that count. 0 spaces: 3 VP to the Protestant, 1-7 spaces: 2 VP to Protestant, 1 VP to England; 8-11 spaces: 1 VP to Protestant, Spain and England; 12-19 spaces: 2 VP to Spain; 20-21 spaces: 3 VP to Spain. Card remains in deck each turn. 84 Henry III (Anjou) Mandatory 2 3 No Charles IX dies. 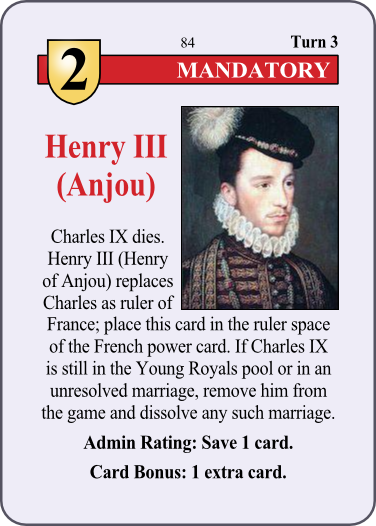 Henry III (Henry of Anjou) replaces Charles as ruler of France; place this card in the ruler space of the French power card. If Charles IX is still in the Young Royals pool or in an unresolved marriage, remove him from the game and dissolve any such marriage. Admin Rating: Save 1 card. Card Bonus: 1 extra card. 85 Murad III Mandatory 2 3 No Selim II dies. 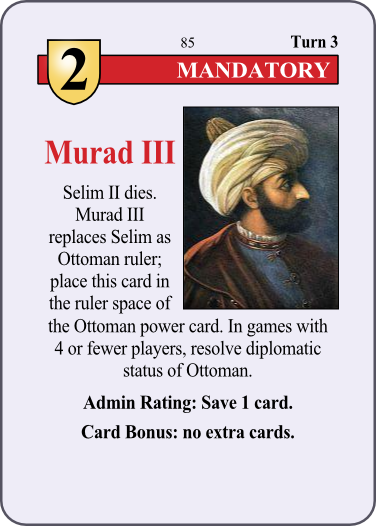 Murad III replaces Selim as Ottoman ruler; place this card in the ruler space of the Ottoman power card. 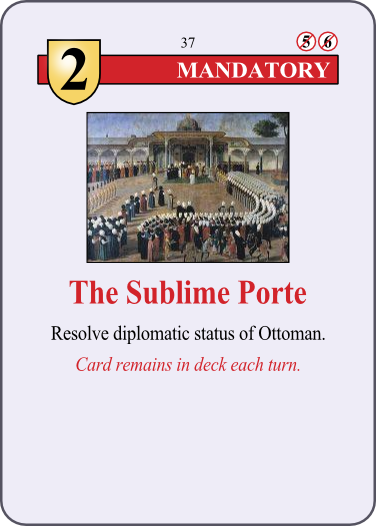 In games with 4 or fewer players, resolve diplomatic status of Ottoman. Admin Rating: Save 1 card. Card Bonus: no extra cards. 86 Polish Royal Election Mandatory 2 3 Yes End any Foreign Wars between the Holy Roman Empire and Poland. 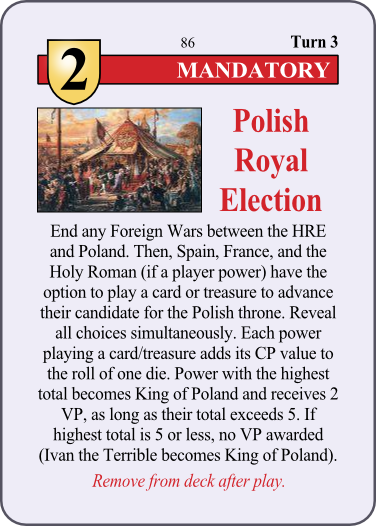 Then, Spain, France, and the Holy Roman (if a player power) have the option to play a card or treasure to advance their candidate for the Polish throne. Reveal all choices simultaneously. Each power playing a card/treasure adds its CP value to the roll of one die. Power with the highest total becomes King of Poland and receives 2 VP, as long as their total exceeds 5. If highest total is 5 or less, no VP awarded (Ivan the Terrible becomes King of Poland). Remove from deck after play. 87 Rudolf II Mandatory 2 3 No Maximilian II dies. 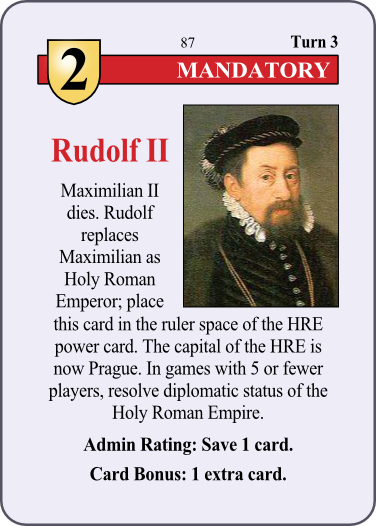 Rudolf replaces Maximilian as Holy Roman Emperor; place this card in the ruler space of the Holy Roman Empire power card. The capital of the Holy Roman Empire is now Prague. 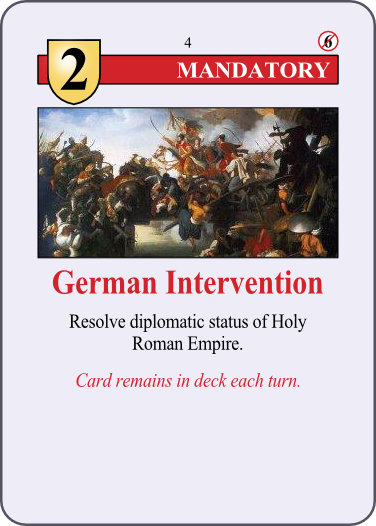 In games with 5 or fewer players, resolve diplomatic status of Holy Roman Empire. Admin Rating: Save 1 card. Card Bonus: 1 extra card. 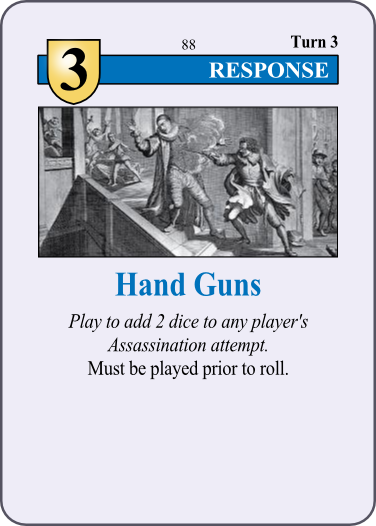 88 Hand Guns Response 3 3 No Play to add 2 dice to any player's Assassination attempt. Must be played prior to roll. 89 Mary Queen of Scots Response 3 3 Yes* Only playable if Mary Queen of Scots is alive. 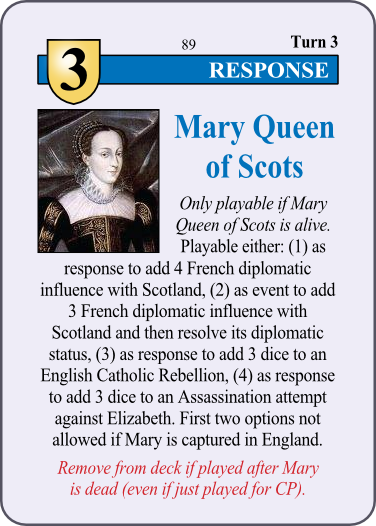 Playable either: (1) as response to add 4 French diplomatic influence with Scotland, (2) as event to add 3 French diplomatic influence with Scotland and then resolve its diplomatic status, (3) as response to add 3 dice to an English Catholic Rebellion, (4) as response to add 3 dice to an Assassination attempt against Elizabeth. First two options not allowed if Mary is captured in England. Remove from deck if played after Mary is dead (even if just played for CP). 90 Priest Holes Response 1 3 No Cancel the neutralization of 1 Jesuit. 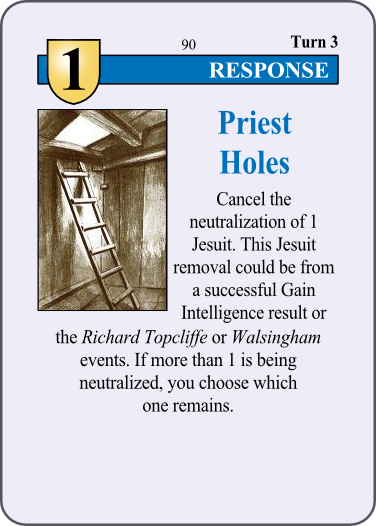 This Jesuit removal could be from a successful Gain Intelligence result or the Richard Topcliffe or Walsingham events. If more than 1 is being neutralized, you choose which one remains. 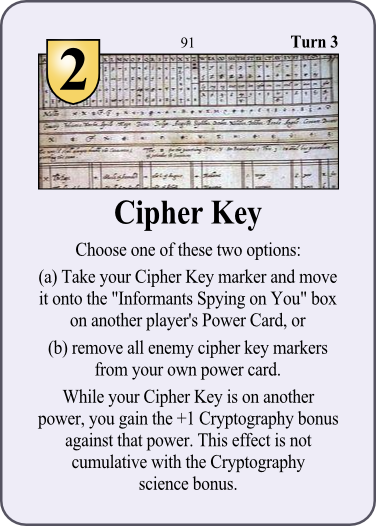 91 Cipher Key Event 2 3 No Choose one of these two options: (a) Take your Cipher Key marker and move it onto the "Informants Spying on You" box on another player's Power Card, or (b) remove all enemy cipher key markers from your own power card. While your Cipher Key is on another power, you gain the +1 Cryptography bonus against that power. This effect is not cumulative with the Cryptography science bonus. 92 Double Agent Event 3 3 No Remove an enemy informant and add one of your own to spy on that power. 93 English College, Douai Event 2 3 Yes Playable If either the Lille or Dunkirk space is Catholic. 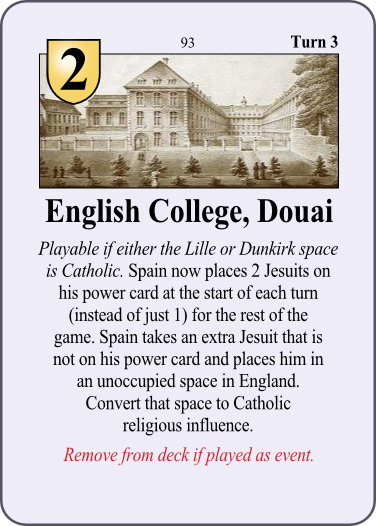 Spain now places 2 Jesuits on his power card at the start of each turn (instead of just 1) for the rest of the game. Spain takes an extra Jesuit that is not on his power card and places him in an unoccupied space in England. Convert that space to Catholic religious influence. Remove from deck if played as event. 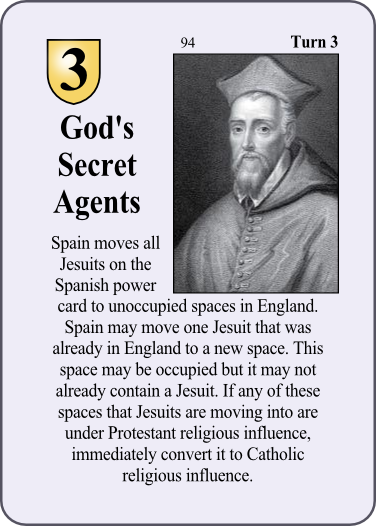 94 God's Secret Agents Event 3 3 No Spain moves all Jesuits on the Spanish power card to unoccupied spaces in England. Spain may move one Jesuit that was already in England to a new space. This space may be occupied but it may not already contain a Jesuit. If any of these spaces that Jesuits are moving into are under Protestant religious influence, immediately convert it to Catholic religious influence. 95 Louise of Lorraine Event 1 3 Yes Not playable by Ottoman. 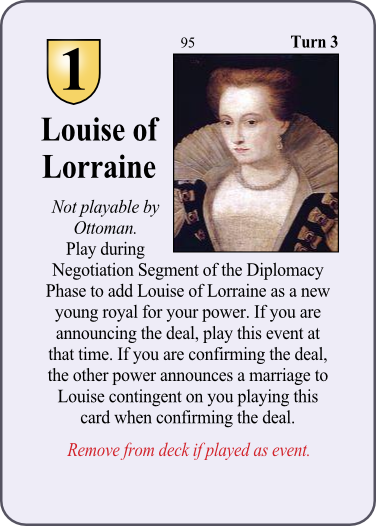 Play during Negotiation Segment of the Diplomacy Phase to add Louise of Lorraine as a new young royal for your power. If you are announcing the deal, play this event at that time. If you are confirming the deal, the other power announces a marriage to Louise contingent on you playing this card when confirming that deal. Remove from deck if played as event. 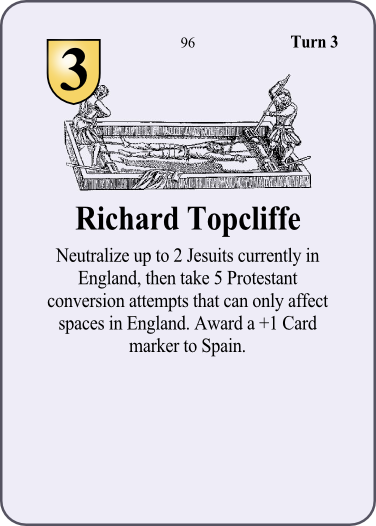 96 Richard Topcliffe Event 3 3 No Neutralize up to 2 Jesuits currently in England, then take 5 Protestant conversion attempts that can only affect spaces in England. 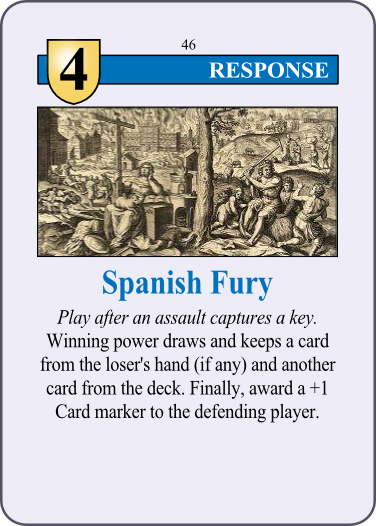 Award a +1 Card marker to Spain. 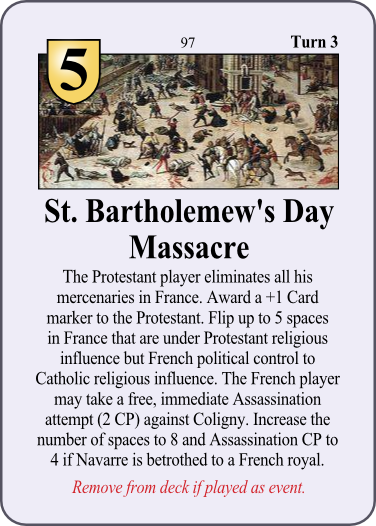 97 St. Bartholomew's Day Massacre Event 5 3 Yes The Protestant player eliminates all his mercenaries in France. 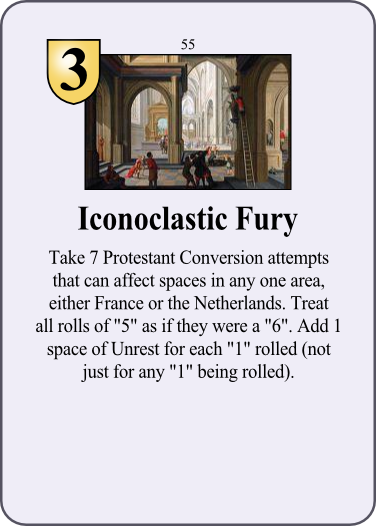 Award a +1 Card marker to the Protestant. Flip up to 5 spaces in France that are under Protestant religious influence but French political control to Catholic religious influence. The French player may take a free, immediate Assassination attempt (2 CP) against Coligny. Increase the number of spaces to 8 and Assassination CP to 4 if Navarre is betrothed to a French royal. Remove from deck if played as event. 98 Sultana Safiye Event 3 3 No Playable if Murad is the Ottoman ruler. 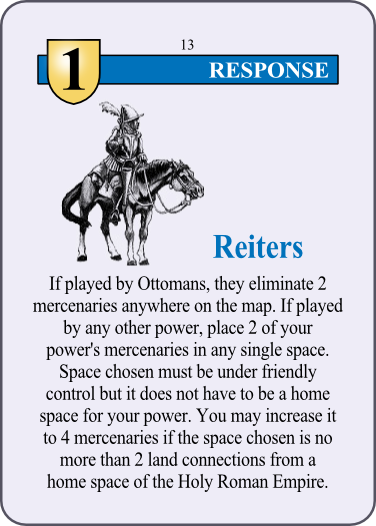 The Ottoman picks one other power and gives a card of their choice to that power. Before looking at that card, the chosen power selects a card from their hand to give back to the Ottoman. 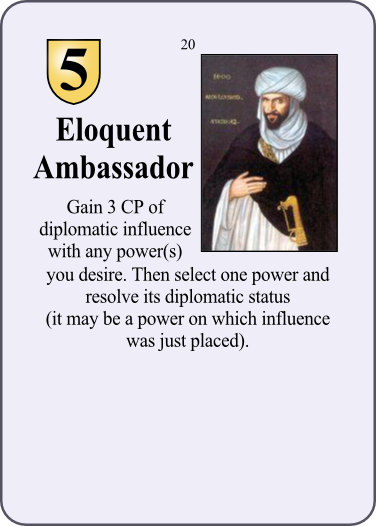 If the chosen power was England or France, the Ottoman then draws 1 additional card from the deck. OR Playable by any power eligible to have diplomatic influence with Venice. Gain 2 influence with Venice and then resolve its diplomatic status. 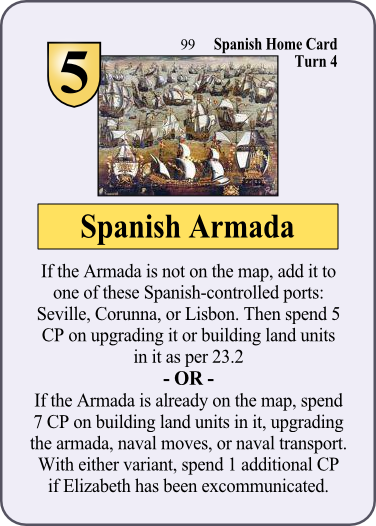 99 Spanish Armada Home 5 4 No If the Armada is not on the map, add it to one of these Spanish-controlled ports: Seville, Corunna or Lisbon. Then spend 5 CP on upgrading it or building land units in it as per 23.2. OR If the Armada is already on the map, spend 7 CP on building land units in it, upgrading the armada, naval moves, or naval transport. With either variant, spend 1 additional CP if Elizabeth has been excommunicated. 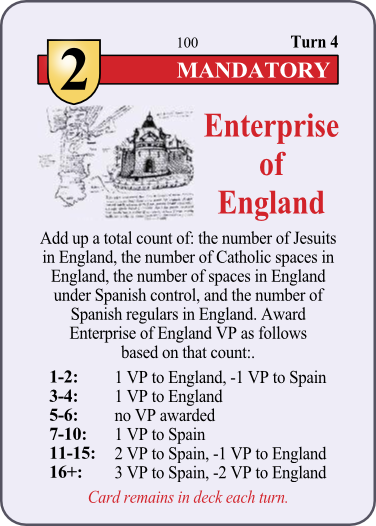 100 Enterprise of England Mandatory 2 4 No Add up a total count of: the number of Jesuits in England, the number of Catholic spaces in England, the number of spaces in England under Spanish control, and the number of Spanish regulars in England. Award Enterprise of England VP as follows based on that count. 1-2: 1 VP to England, -1 VP to Spain; 3-4: 1 VP to England; 5-6: no VP awarded; 7-10 1 VP to Spain; 11-15: 2 VP to Spain, -1 VP to England; 16+: 3 VP to Spain, -2 VP to England. Card remains in deck each turn. 101 Gregorian Calendar Response 3 4 Yes Play just after a power has finished an impulse. Reset the turn order to any other power who takes the next move (it may be the same power who just moved). If you control the Papacy, draw 1 card from deck. Remove from deck if played as response. 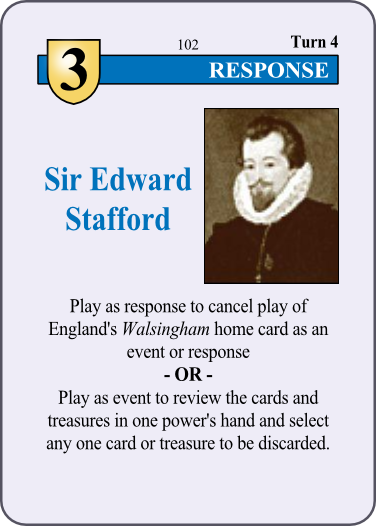 102 Sir Edward Stafford Response 3 4 No Play as response to cancel play of England's Walsingham home card as an event or response OR Play as event to review the cards and treasures in one power's hand and select any one card or treasure to be discarded. 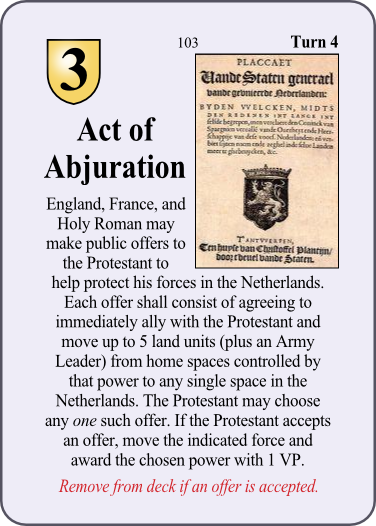 103 Act of Abjuration Event 3 4 Yes* England, France, and Holy Roman may make public offers to the Protestant to help protect his forces in the Netherlands. Each offer shall consist of agreeing to immediately ally with the Protestant and move up to 5 land units (plus an Army Leader) from home spaces controlled by that power to any single space in the Netherlands. The Protestant may choose any ONE such offer. If the Protestant accepts an offer, move the indicated force and award the chosen power with 1 VP. Remove from deck if an offer is accepted. 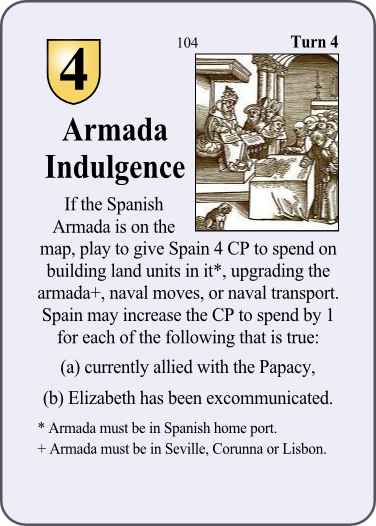 104 Armada Indulgence Event 4 4 No If the Spanish Armada is on the map, play to give Spain 4 CP to spend on building land units in it*, upgrading the armada+, naval moves, or naval transport. Spain may increase the CP to spend by 1 for each of the following that is true: (a) currently allied with the Papacy, (b) Elizabeth has been excommunicated. *Armada must be in Spanish home port. +Armada must be in Seville, Corunna or Lisbon. 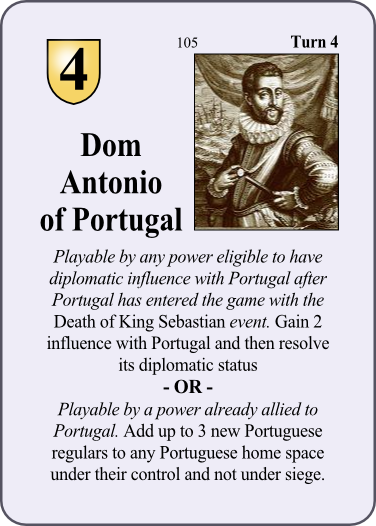 105 Dom Antonio of Portugal Event 4 4 No Playable by any power eligible to have diplomatic influence with Portugal after Portugal has entered the game with the Death of King Sebastian event. Gain 2 influence with Portugal and then resolve its diplomatic status. OR Playable by a power already allied to Portugal. Add up to 3 new Portuguese regulars to any Portuguese home space under their control and not under siege. 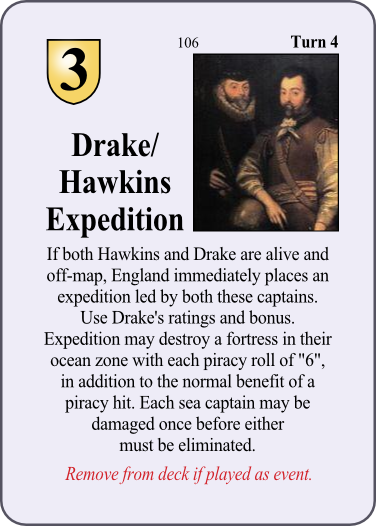 106 Drake/Hawkins Expedition Event 3 4 Yes If both Hawkins and Drake are alive and off-map, England immediately places an expedition led by both these captains. Use Drake's ratings and bonus. Expedition may destroy a fortress in their ocean zone with each piracy roll of "6", in addition to the normal benefit of a piracy hit. Each sea captain may be damaged once before either must be eliminated. Remove from deck if played as event. 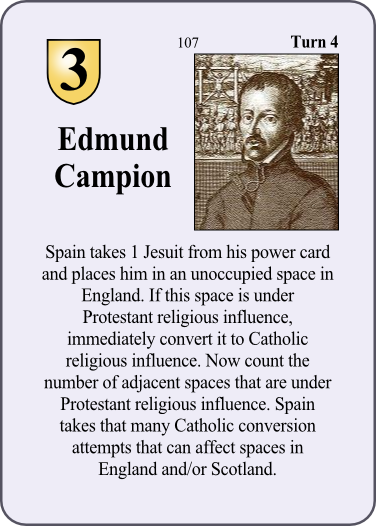 107 Edmund Campion Event 3 4 No Spain takes 1 Jesuit from his power card and places him in an unoccupied space in England. If this space is under Protestant religious influence, immediately convert it to Catholic religious influence. Now count the number of adjacent spaces that are under Protestant religious influence. Spain takes that many Catholic conversion attempts that can affect spaces in England and/or Scotland. 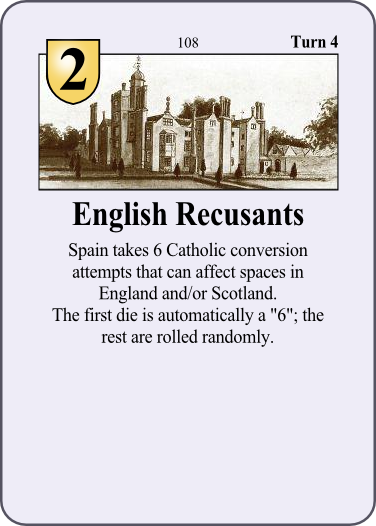 108 English Recusants Event 2 4 No Spain takes 6 Catholic conversion attempts that can affect spaces in England and/or Scotland. The first die is automatically a "6"; the rest are rolled randomly. 109 Union of Arras Event 4 4 Yes Remove all mercenaries from the Netherlands. No more rebellions in the Netherlands this turn. For the rest of the game, the split orange/yellow spaces are treated as Spanish home spaces. Spain then chooses 5 orange/yellow spaces and either changes political control of the space to Spanish or religious influence to Catholic. Add up to 4 Walloons to a Spanish controlled space in the Netherlands. For each Walloon added, displace a Spanish regular out of the Netherlands. Remove from deck if played as event. 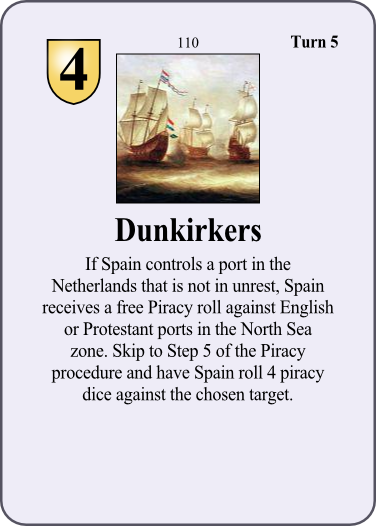 110 Dunkirkers Event 4 5 No If Spain controls a port in the Netherlands that is not in unrest, Spain receives a free Piracy roll against English or Protestant ports in the North Sea zone. 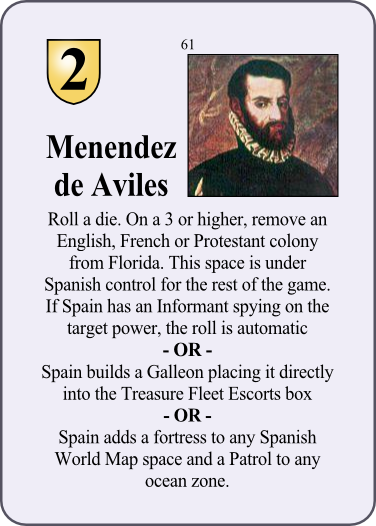 Skip to Step 5 of the Piracy procedure and have Spain roll 4 piracy dice against the chosen target. 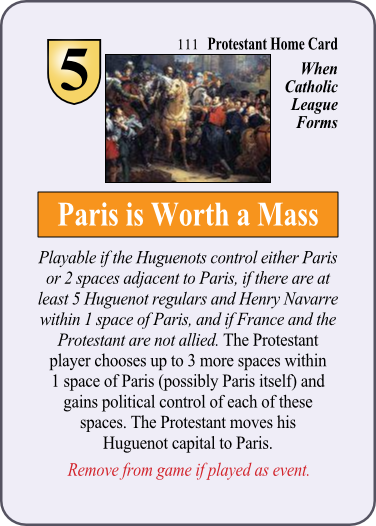 111 Paris is Worth a Mass Home 5 Variable Yes Playable if the Huguenots control either Paris or 2 spaces adjacent to Paris, if there are at least 5 Huguenot regulars and Henry Navarre within 1 space of Paris, and if France and the Protestant are not allied. The Protestant player chooses up to 3 more spaces within 1 space of Paris (possibly Paris itself) and gains political control of each of these spaces. The Protestant moves his Huguenot capital to Paris. Remove from game if played as event. 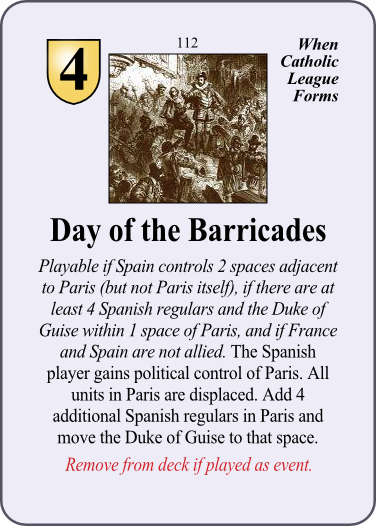 112 Day of the Barricades Event 4 Variable Yes Playable if Spain controls 2 spaces adjacent to Paris (but not Paris itself), if there are at least 4 Spanish regulars and the Duke of Guise within 1 space of Paris, and if France and Spain are not allied. The Spanish player gains political control of Paris. All units in Paris are displaced. Add 4 additional Spanish regulars in Paris and move the Duke of Guise to that space. Remove from deck if played as event.